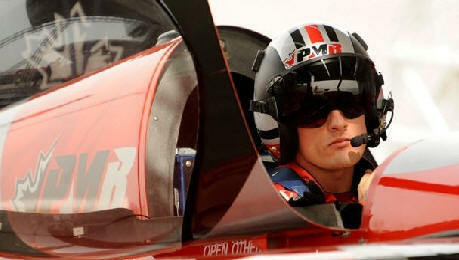 March 4, 2010 - With only weeks to go before the first stop of the 2010 Red Bull Air Race World Championship, pilots are seeking optimum training conditions in order to be fighting fit for the Abu Dhabi race at the end of March. It seems the Arizona desert is an ideal location for putting any recent modifications to the test as well as providing favorable weather for flying. Pete McLeod – one of last year’s four rookies – has been based in the arid southern US state for the past few weeks, as well as defending world champion Paul Bonhomme and Arizona resident Kirby Chambliss. For Canadian pilot McLeod, the opportunity to migrate to a warmer climate means he can keep on track with his 2010 pre-season training schedule. Back at the team’s base in London, Ontario, temperatures were below freezing while in Arizona, McLeod took full advantage of the mild conditions and continued his training without any risk of snow flurries. McLeod has been busy with a combination of test and training flights since arriving in Chandler, just outside Phoenix, during February and says things are progressing well. Team technician Ted Reynolds has also been working hard since the final race of 2009 last October to vastly improve the set-up of the team’s Edge 540. The Canadians are pinning their hopes of success on the overhauled machine. McLeod has dedicated the past year almost entirely to racing and says apart from briefly returning home to Red Lake, Ontario, during hunting season and at Christmas, he has been flat out running the team. With a clear goal in mind to win the championship before he reaches 30, this ambitious pilot is prepared to put his social life on hold to realise his career objectives. McLeod holds his hands up when asked about the lessons learned in his debut season and admits he wasn’t expecting such a gap in performance between his raceplane and those of the top pilots. One such team that has placed great emphasis on increasing power is title defending Team Bonhomme. With a new engine set-up and significant weight loss to the airframe, technician Wade Hammond has been cocooned away in Arizona for the past couple of months refining the already super aerodynamic race plane in anticipation of the 2010 season. Also relocating to Chandler in the final weeks leading up to Abu Dhabi, Bonhomme fled the inhospitable conditions in the UK in order to gain all-important time at the controls of his Edge 540 and to assess Hammonds engineering efforts. The British world champion was happy to be testing alongside McLeod and Chambliss, pointing out that the hospitality in the USA was just as warm as the climate.